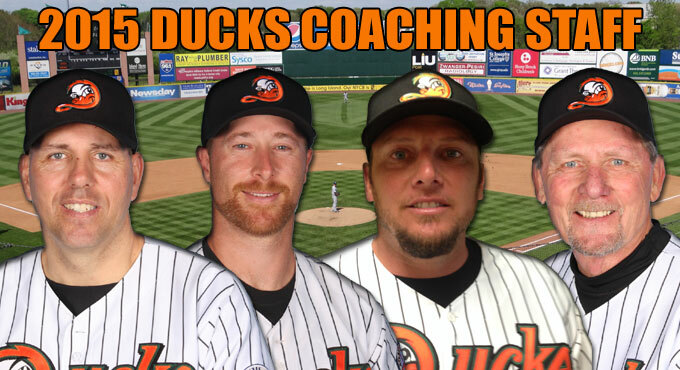 (Central Islip, N.Y., Feb. 11, 2015) – The three-time Atlantic League champion Long Island Ducks today announced the finalization of their coaching staff for the 2015 season. In addition to the return of manager Kevin Baez, bench coach Bud Harrelson and hitting coach Lew Ford, Marty Janzen will begin his first season as pitching coach for the Ducks. Janzen most recently served as the pitching coach for the Lancaster Barnstormers from 2011-2013. While there, he helped guide the Barnstormers pitching staff to a Freedom Division championship, the league’s best ERA (3.60) in 2012 and postseason appearances in both 2011 and 2012. Prior to joining Lancaster, he served as the pitching coach for the Southern Maryland Blue Crabs in 2010. That season, the Blue Crabs pitching staff posted a league-best 3.58 ERA and earned a spot in the Atlantic League playoffs. After being signed by the New York Yankees in 1991, Janzen played professionally for 14 seasons, reaching the game’s highest level pitching for the Toronto Blue Jays in 1996 and 1997. He came to the Blue Jays in the 1995 David Cone trade between Toronto and New York. Following the 1997 season, he was selected by the Arizona Diamondbacks in the expansion draft. The 41-year-old went on to spend parts of four seasons in the Atlantic League (2000-01, 04-05) with the Nashua Pride, Camden Riversharks and Atlantic City Surf. In that span, he combined to post a record of 11-7 with a 3.32 ERA and 113 strikeouts in 160 innings. For his minor league career, the Florida native was 65-56 with a 4.07 ERA and 880 strikeouts in 257 games (170 starts). Baez returns to the Ducks for his fifth season as manager, making his tenure the second-longest in franchise history. Under his leadership, the Ducks have posted a 277-265 record during the regular season and a 16-10 record in the playoffs. Baez has led the Ducks to four half-season Liberty Division titles, three Liberty Division championships and two Atlantic League championships. In addition, he is the only person in league history to win an Atlantic League title as both a player and a manager, hoisting the trophy while serving as a shortstop with Long Island in 2004. Harrelson has served has been a member of the Ducks coaching staff since the team’s inception in 2000. After leading the Ducks to an 82-58 record as manager during the inaugural season, he moved to the position of first base coach for home games in 2001. The fan favorite, who helped introduce “Buddy Ball” to Long Island, has won championships as a player (‘69 World Series champion Mets, ‘73 National League champion Mets), a coach (‘86 World Series champion Mets) and an owner/coach (’04, ’12 and '13 Atlantic League champion Ducks). Ford will begin his second season as hitting coach in 2015 while also continuing to serve as an outfielder for the Ducks. Under his tutelage in 2014, he guided Long Island’s offense to Atlantic League leading totals in batting average (.279), on-base percentage (.345), hits (1,360), walks (458) and at-bats (4,882). In addition, three Ducks ranked among the league’s Top 10 in batting average, including Ford (second, .347), Adam Bailey (seventh, .301) and Cody Puckett (eighth, .298).